An interview with Verdicchio’s mixologist and bartender on the resurgence of bitters in cocktail culture. Bitters can transforms the appearance, flavour and aroma of a cocktail. Just a dash or two will balance flavours and add new dimension and depth to a mixed drink. 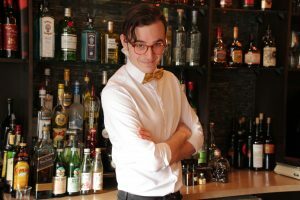 Just ask Justin Trottier, mixologist and barkeeper at Verdicchio Ristorante. If you’ve ever had the chance to sit at the bar, you would have discovered Justin’s enthusiasm – and knowledge – for everything cocktail. He is responsible for creating our cocktail menu, which changes on a monthly basis. When creating a drink Justin considers what seasonal ingredients are available and follows our mandate to source locally whenever possible. Verdicchio has at least 15 different flavours of bitters, including Frape & Sons , a boutique bitters distiller in Thunder Bay, Ont. We sat down with Justin to chat about bitters and what advice he had for incorporating the ingredient into your own cocktails at home. What’s all the rage about bitters, now? Bitters, and I’m talking about non-potable cocktail bitters, have been around since the early 1800’s – as we know them today, anyway. Evidence suggests that tonics made of bitter and medicinal ingredients have been around as long as 7000 B.C, and were said to cure “all that ails you”. These days, cocktail bitters are the bartender’s equivalent of a chef’s spice rack. They are made by macerating botanicals, fruits, roots, barks, and various other ingredients in high-proof alcohol. They add depth and complexity and can help balance cocktails for a more rounded profile. Prohibition brought an end to small-scale bitters production for most everyone but Angostura, the granddaddy of “aromatic” bitters (that is to say, a balance of botanicals to give you a cohesive whole, instead of a dominant flavour). 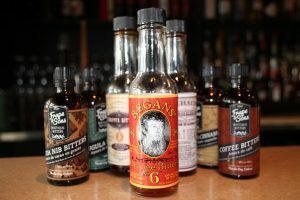 Peychaud and Regan are also household names in the world of bitters, and can even be held responsible for the huge boom in production we see today. What do you look for in choosing a good bitter? As always in the culinary arts, ingredients and their source matter the most. Pioneers in bitters production today are able to source their ingredients from all over the world, so there really is no excuse for poor quality. That being said, I’m always partial towards producers that strive to use local ingredients and capture the essence of their geographic location. I lean towards more intense and immediate flavours so that the bitters don’t get lost in the cocktail, but instead bring their own element. If you know much about the bitters from Thunder Bay, do tell! Frape & Sons is a relatively new distillery based in Thunder Bay, Ontario. They’ve really been focusing on using locally sourced ingredients such as botanicals from Northern Ontario’s boreal forests, fruits and foods from Thunder Bay’s local producers, and water from the Great Lakes. Unconventional as it may be, Frape & Sons doesn’t use neutral grain spirits in their formulations, but instead pair different alcoholic bases with each individual recipe for a more rounded, cleaner finish. What advice do you have for mixologists at home when using bitters in cocktails? Less is more! Bitters are potent, even in small doses. It’s easy to burry the subtle nuances of your chosen spirits in a cocktail if you’ve drowned it with bitters. Start with a dash or two and taste as you go. But remember, rules are made to be broken. I’m partial towards Dr. Adam Elmegirab’s Cocktail Bitters. He specifically states a “for bartenders, by bartenders” approach. His bitters are handcrafted with care and special attention to each ingredient. He pays homage to the golden age of cocktails in the 1800’s by recreating classic recipes lost in time. My current go-to is Fee Brother’s Aztec Chocolate Bitters. You’d be surprised just how much they transform classic cocktails, from a crisp and spicy rye Manhattan to a rich and warming rum Old Fashioned. Have you ever tried making your own bitters? I’ve dabbled. I have experimented with some candied lime bitters done in an over-proof rum, and they turned out wonderfully. Without giving too much away, I’ve got some pretty big plans for my next menu turnover at the restaurant this coming season. Experimentation is key. Substituting bitters for similar flavours in well-established cocktail recipes can lead to some pretty great discoveries. The word “cocktail” literally means a combination of spirit, bitters, sugar, and water. Bourbon and cherry bitters, mezcal and chocolate bitters, tequila and celery bitters, gin and chamomile bitters… the list goes on and on. Please share one of your favourite cocktail recipes. My favourite after a long shift is a Mezcal Old Fashioned with Fee Brother’s Aztec Chocolate Bitters. In a mixing glass, I combine 2oz Jaral De Berrio Mezcal, 1/4oz demerara syrup, a splash of mineral water, and 2-3 dashes of Aztec Chocolate Bitters. Stirred with ice until properly diluted, I drink it neat in a lowball glass that I smoke with a few cracked cinnamon sticks.